Debbie Stoller Stitch & bitching with Bust editor and knitting superstar, Debbie Stoller. RoseHead Give yourself a very rosy hairstyle this Christmas. Christmas Chills Tim Burton's The Nightmare Before Christmas. Teacosies With Irony A Christmas addition of our resident comic strip by Beth McMillan. Gift Guide The Snippets wishlist of great Christmas gifts and stocking stuffers. I Heart Mac N Cheese Win a wonderful new handbag by I <3 Mac N Cheese by showing us what you're going to put in it. Beauty Tips Cathryn shares her tips for winter holiday perfect looks. Ethical Gifts Rather than adding to family and friends clutter this Christmas, give them a gift that will make a real difference. Merry Christmas America Win a copy of the new book by Bruce Littlefield by showing off your Christmas decorations, trees and displays. Sohodolls We chat to London rockers, the Sohodolls. Wine Tasting Party Throw yourself a cosy wine tasting party this Christmas. Buy Handmade Be unique this Christmas and take the pledge to only give and receive handmade gifts. Contemporary Christmas Danielle Spires shares her approach for a very contemporary Christmas. Win a copy of the new book by Bruce Littlefield by showing off your Christmas decorations, trees and displays. We've got 3 copies of the new book by Bruce Littlefield, Merry Christmas America (the follow up to Garage Sale America) to give away. 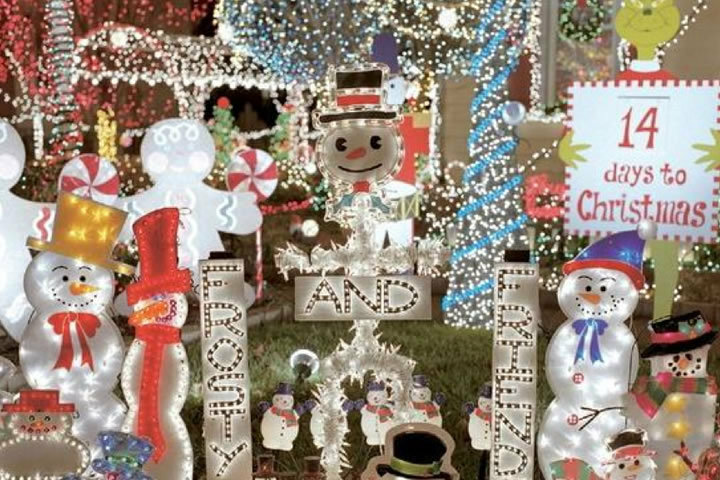 The book showcases how people decorate their homes for Christmas across the US, so we're giving you the chance to win a copy of the book by showing us your display. Post a comment below with a photo of your Christmas display (decorations, Christmas tree, fairy lights etc). Congratulations to our winners: Emelia L, Leigh-Anne D & Roma. You can find out more about Bruce and his books on his blog or pick up a copy of Merry Christmas America from Harper Collins. “My husband and I worked together to make this gingerbread house. I donated it to an auction to raise money for the drama club at the school where I work (They were putting on the play Hansel and Gretel). Yukon Cornelius: Fog's as thick as peanut butter. Yukon Cornelius: You eat what you like and I'll eat what I'll like. Hope the season brings all the things you like. The quote was from Rudolph the Red-Nosed Reindeer. I typed it up on my typewriter and scanned it! Then off to the printer it went! We had a great Christmas, and I think we are going to leave our tree and lights up for at least 2 more weeks! “and this is my new way of making the fireplace look snazzy! Take some garland and wrap lights around them and drape them across your fireplace, so your fireplace looks like it's glowing without a fire. “This christmas, our display was a bit delayed. My mum got run over by a car a few days before it was time to go and get a tree so there was a bit of a drama for christmas to contend with. My dad, being uninterested in christmas decorations wasn't enthusiastic about putting the decorations up, and since my mum was on crutches she couldn't really help out either. By some miracle of god I managed to get the real and very prickly christmas tree into the stand, standing up straight and on the ledge, and then I had to put up the decorations following all traditions whilst my mother barked orders at me from the sofa. Thankfully the house feels all christmassy now, with traditional poorly made pre-school decorations hanging from the tree and the smell of pine filling everywhere.